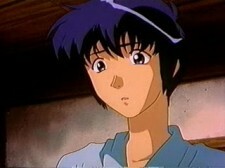 Yusuke is an orphaned high school student who has to make it on his own. One day, he is late to class and is forced to take a shortcut to get there in time. As he travels, a silver bracelet hits him on the head and he stops in response. Once he looks up he sees a young girl floating from the heavens directly towards him. The girl only recalls her name, Rouge, but besides that has amnesia. In an effort of good-will, Yusuke brings the poor girl to his apartment and once the two get to know each other, he promises to help her discover her lost memories (and also let her stay with him for as long as she needs). Yusuke is quick to fall for the girl’s innocent and naïve charm as he tries his best to be a gentlemen and a caring person towards Rouge. It should also be said that Yusuke has a habit of saying, "Oh Mother, Oh Father in Heaven! ", when things go direly wrong.